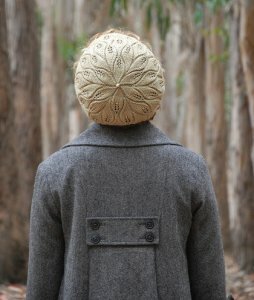 Taken from Coastal Knits: "Rustling Leaves is the perfect fall accessory. Knit from the bottom up, this beret features beautiful elongated leaves that slant in different directions as if they were rustling in the wind." This pattern is in Coastal Knits, page 59. Size US 3-16" circs, US 2-16" circs, and US 3 DPNs (or sizes needed to obtain gauge) are required but not included. Finished Measurements: Stretches to fit a 19-22" head circum. Gauge: 28 sts over 4". Color Shown is Tactile Fiber Arts Wild Crafted. Author suggests Tosh Sock.